CHICAGO, IL, December 9, 2009 – ShopperTrak RCT Corporation’s Retail Traffic Index (SRTI) today reported that total U.S. foot traffic for the month of November fell 6.1 percent while the company’s National Retail Sales Estimate (NRSE) reported retail sales slipped a very slight 0.1 percent for the same period. Don’t believe the pumpers folks – as I reported earlier, Gallup says that per-person spending is down huge – more than 20% year/over/year – and last year sucked. Grinchmas II cometh, and it appears it will be worse than last year. 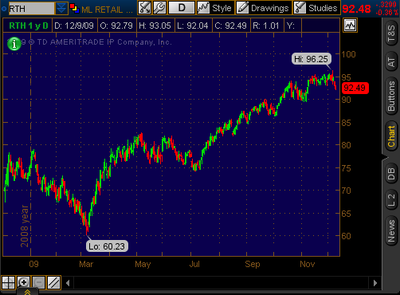 That’s the "Retail Holders" ETF, covering (roughly) the retail universe. The "optimism" you see reflected in that chart is due to the crooners all calling an imminent recovery in consumer spending for the last six months. Now we’re being presented evidence that it has not occurred and the excuses are starting – "consumers are waiting until the last minute for better deals" and similar. Sales at its namesake Neiman Marcus and Bergdorf Goodman stores open for at least a year, or same-store sales, continued to fall, dropping 14.9 percent during the quarter. Overall comparable sales, including its direct marketing segment, declined 13.7 percent. Oh yeah, that portends a recovering economy and consumer spending, considering that the comps were from last year when the entire world was one big financial fireball following Lehman, AIG and the stock market’s collapse.